When I lived in West Germany, I can recall two sports that everyone in the area paid attention to. Obviously the first was football (soccer to us Yankees). The other? Professional cycling! Maybe it was because we were close to the French border, but rarely a weekend went by without us spotting cyclists in full garb training for an upcoming race. And every year during the summer local residents would be glued to their televisions rooting on members of the German team as they took part in the Tour de France. I was fascinated by it too. Not because of the speed or the technology of the bicycles, but by the teamwork put forth in order to get their star rider across the line first. For the uninformed, professional cycling is all about getting the team win, usually by carefully utilizing all team members to get their most accomplished rider to the podium. I always felt bad for the non-winning members of the team, wondering why they participated. Now that I’m older I understand their place in the race. The most exciting part of any professional cycling event is the last kilometer. This is the final sprint to the finish line, and at that point most forget about any team loyalty and just give all they’ve got to get to the finish. This final distance is marked by a red flag, a Flamme Rouge, and signals all riders that the end of the race is upon them. When I found out there was a board game by the same name by a Finnish company (Lautapelit), I knew it was one that belonged in my collection. And what perfect timing – we’re smack in the middle of this year’s Tour de France on NBC! 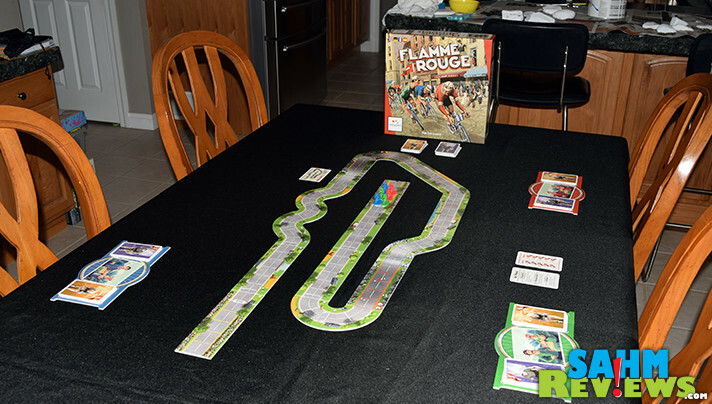 At first glance, Flamme Rouge may appear like any of the many racing-themed board games out there. But it’s simplicity and unique mechanics for this type of game is what makes it stand out from the rest. Supporting from two to four cyclists (and it plays well with any of these quantities), you are trying to get one of your two team riders across the finish line first. To set up the game, one of six stages are selected randomly from the set of Stage cards. The track is assembled according to the stage’s diagram, paying attention to the letter printed on each tile. Each player receives a Rouleur (roller) and a Sprinteur (Sprinter) miniature and places them behind the start line. All participants are working from identical color-coordinated decks, one for each type of rider. 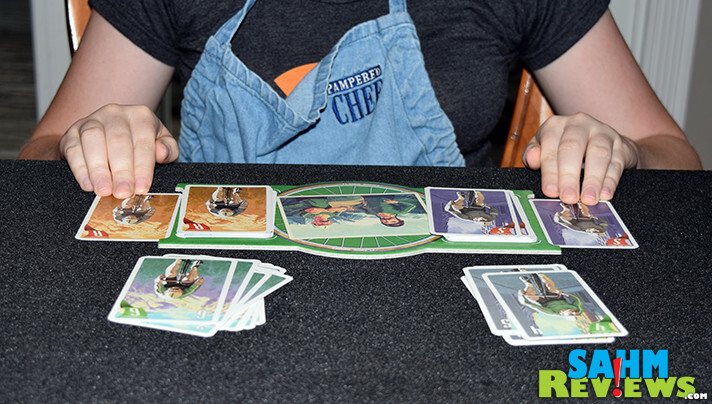 Simultaneously, everyone draws four cards from one of their decks, selects one to play (face down) and then returns the other three back to the bottom of the deck, face up. The same process is repeated for the other deck, then all cards are revealed at the same time. 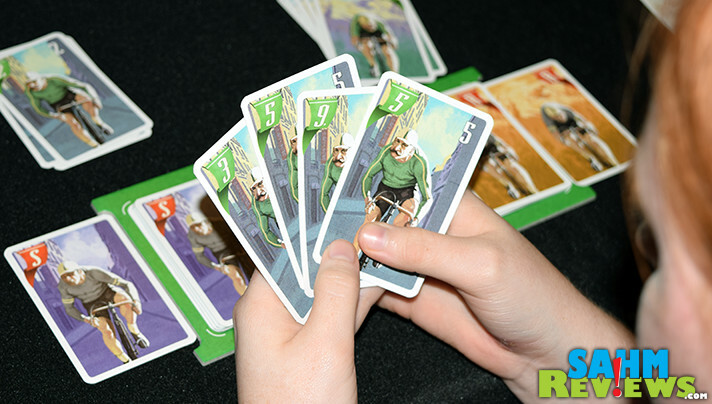 The values on the cards are the number of spaces you will move each rider. Movement is easy, with riders being able to move through other riders. The only limitation is that if you were to land on a space already occupied, you must stop right behind them. Once all bicycles have been moved (starting with the frontmost rider and continuing to the back of the pack), the used cards are discarded and the board is checked for slipstreaming. 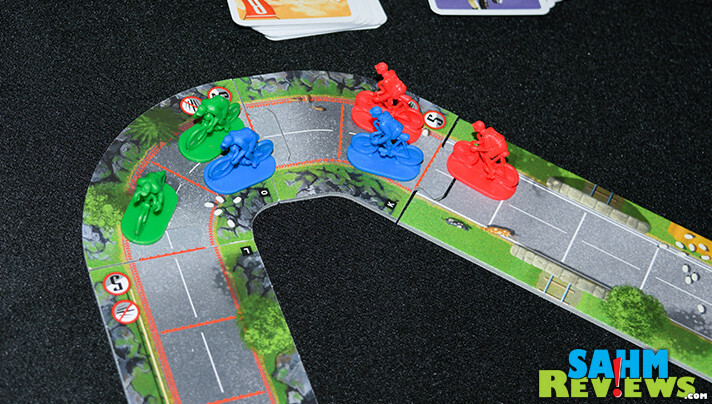 Much like a NASCAR race, bonus movement in Flamme Rouge is awarded thanks to drafting. If there is exactly one space between a rider (or pack of riders) and the group in front of them, they are moved up freely, creating one large pack. However, for any riders that have no one in front of them, including the leader, they are fighting the wind and must take an exhaustion card. These are 2-movement value cards that enter your deck upon reshuffling and clog up your hand with low movement numbers. Mixing things up are mountains on the map which introduce movement restrictions. If you start on, move onto or pass across any red space on the track, this signifies an uphill climb. Regardless of the card you play, you may move no more than five spaces. Alternatively, a blue area denotes a downhill descent! This allows you to move a minimum of five spaces, even if you play a lowly “2” card! Hopefully you’ll have a lucky draw and be able to rid yourself of low-number cards during the downhill portions (and don’t draw high-numbered ones when you’re climbing the mountain). 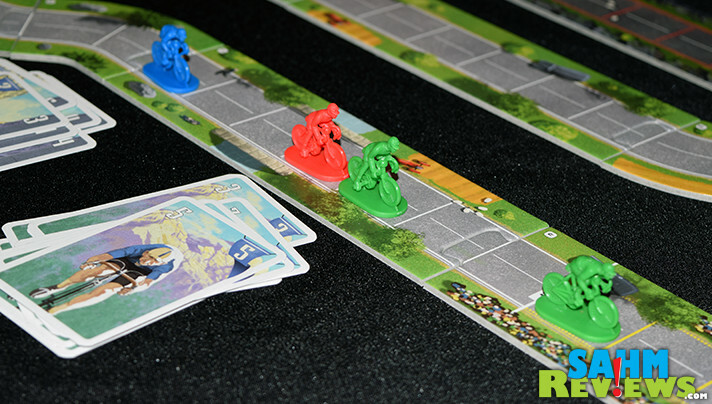 Every game of Flamme Rouge we’ve played thus far has been won by only a space or two. Because of the slipstreaming features, those who begin to lag behind a little bit have a method in which to catch up. Get too far out in the lead early in the game and your deck of cards will be full of exhaustion cards (value = 2), forcing you to slow down. Because of this, it should appeal to all ages as everyone has a fighting chance of being victorious! 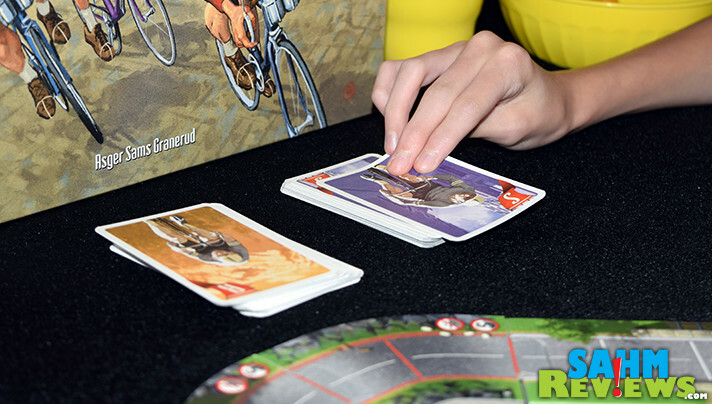 You can find the first edition of Flamme Rouge for purchase on Lautapelit’s website or here in the U.S. on Amazon. 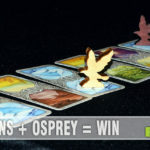 Beginning in August it will be carried by Stronghold Games as the U.S. publisher, but until then it seems Amazon may be your best source. Lautapelit has a number of great titles in their stable, so if you’re not already, follow them on Facebook and Twitter to see them all! Are you watching the Tour de France this year? Have you played formula D, and how does it compare to this? The tiny cars in that game can be a little complicated, and this seems much easier to set up and move the cyclists. I’ve played both Formula D and Thunder Alley. 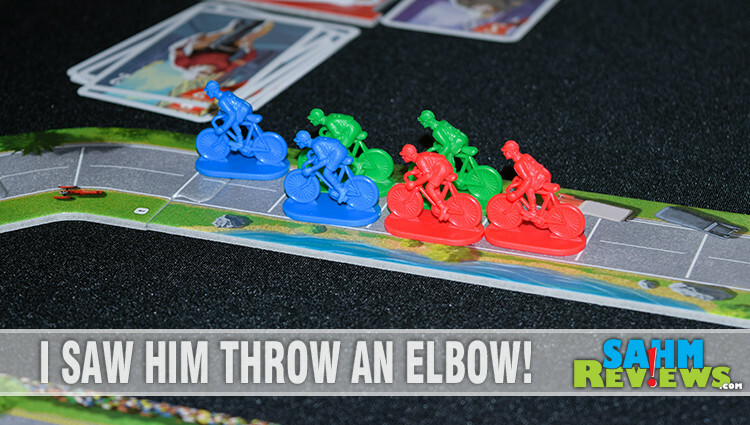 Flamme Rouge is much simpler and easier to teach. 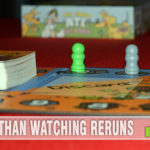 It also plays a LOT quicker, with a 2p game lasting under 20 minutes! Now this sounds like a pretty cool game. 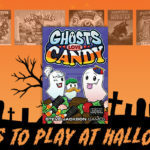 My kids are always seeking to find new board games for our weekly game night. 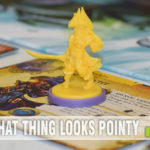 I so enjoy visiting your blog for you share so many board games I’ve never heard of before. I like that it’s not a complicated game and all ages can play. My husband might revolt, but I don’t love watching the race. I think we need to pick up this game to play while watching the coverage. The kids and I can watch the highlights of the race while having fun playing. My friend is a huge Tour de France. I think she would really enjoy this game. It will make for a fun game night. This looks interesting. Might need to check this one out. I didn’t realize cycling was such a popular sport! This looks like a fun game. I feel the designers have missed an opportunity to include female cyclists within the game. There is already a problem in the professional cycling world of women being under represented and being paid significantly less. Among other issues that are being raised (such as recent news about how British Cycling is being run). 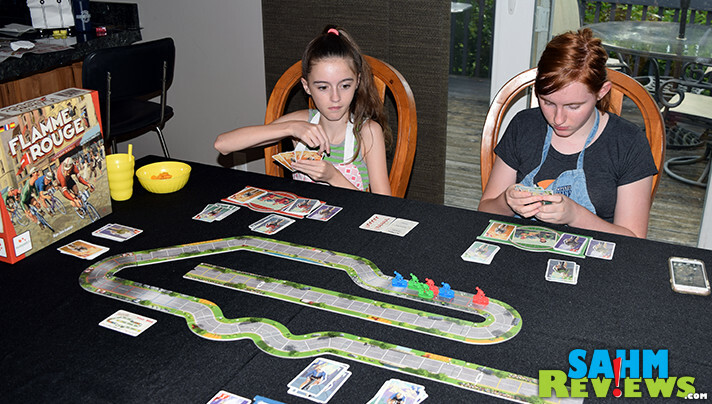 The decision to have all the cyclist as male, could reinforce the issues of under representation of women in cycling and board gaming. Sounds cool. Kids will love to play!